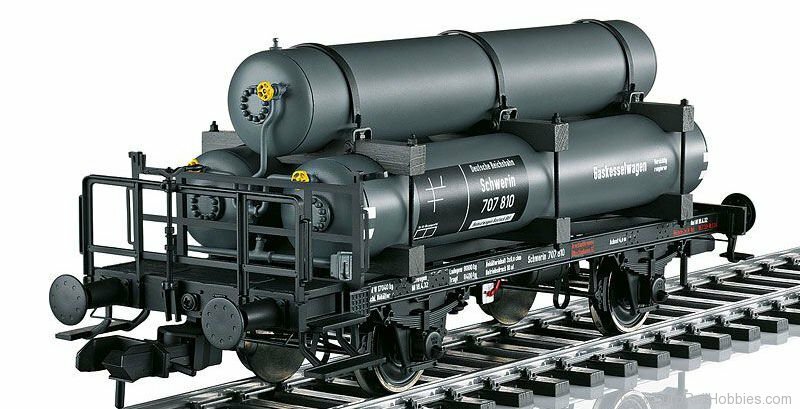 Marklin 58070 1 DRG Maintenance Tank Car. Prototype: Gas tank car with 3 containers as a stacked unit. German State Railroad Company (DRG) maintenance car. Model: The gas tanks have separately applied parts constructed of metal and are prototypically mounted as a load unit with real wooden beams. The flat car has a brakeman's platform. The model has been reworked in the running gear area and is equipped with additional brake parts. Prototype couplers brake hoses are included. Length over the buffers 27.5 cm / 10-13/16".